The real story behind Russell Brand, Tej & her ex husband the "Toner Bandit" & convicted felon! I've known Tej and her ex-husband Harijiwan who Tej now teaches yoga with along with Harijiwan's new wife, for 30 years! Many people may not know the whole story about Tej and Russell Brand. I've known Tej and her ex-husband Harijiwan who Tej now teaches yoga with along with Harijiwan's new wife, for 30 years and I believe this sleaze king, Russell Brand, is going to lead Tej into all kinds of debauchery! 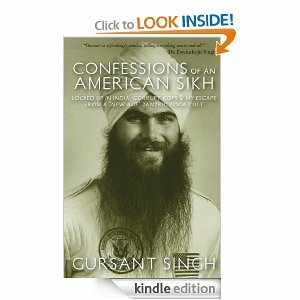 Read "Confessions of an American Sikh" for the details. Yesterday, Russell Brand staged a walkout from Gurmukh Kaur's yoga studio to protest on behalf of his yoga teacher, Tej Kaur, not being treated "right". Gursant Singh reveals "the man his followers refuse to see -- a womanizer and a brute." What do you think? Read "Confessions of an American Sikh" and decide. This is an absorbing story for any reader. And it's a must-read for those caught up in Yogi Bhajan's 3HO/Sikh Dharma --ex-followers, Second Generation casualties, family members, law enforcement, cult researchers -- and for every Kundalini yoga student or Yogi Tea drinker, past or present.